Google says SEOs focus too much on links. I agree. You focus too much on links, imo — I’m glad that we use 100s of factors in our crawling, indexing, and ranking algorithms. Now, take this tweet with a grain of salt as it’s literally 123 characters. But, John has said this a few time as have many other Googlers. Well then they should stop rewarding links so much. It’s a classic SEO thread. I’ve said since about 2011 that I think SEOs think and talk about links too much, and because they do that our industry is not taken seriously and does not get the budgets that it deserves. In fact, I recently removed “link building” as an option on Credo’s main project inquiry form because we found that people coming to us wanting “link building” want bad links for cheap. I want to explain my quick answer of “I agree with John” further because I think we as an industry need to grow up and start taking SEO seriously as a business driver and not just something interesting that we do or “are obsessed with” (I hate that language. Obsession is a negative thing, always). Links absolutely matter for SEO and you will not rank without them. There. I said it. Links matter. They’re important. You need them. My issue, and John’s too, is that links are too often the only think SEOs talk about. In fact, the agency I used to work for had a conference series called LinkLove for a while! That, very much to their credit, has been folded into their SearchLove series now (which IMO is one of the best conferences out there in the search marketing space) and has been for a number of years because they recognized that SEO was broadening and changing. So I hope this settles the question of “Does John think links matter?” And if you tweet at me in anger saying I don’t value links, you can get out of my mentions because I’ll know you didn’t read this. Now, on to more important things. SEO involves links, but links are not SEO. Technical SEO. Without your website able to be crawled by search engines, you won’t rank. Keyword research. Without understanding your market and what pages to have on your site, you will not rank. Content creation, both for conversion-oriented pages as well as editorial content created to rank, be read, and ultimately drive your business. Structured data implementation and entity association. Topical authority. Without content covering the topics you want to rank for, you won’t rank as well. Links. This has already been covered. Now, I fully understand that there are different focus areas within SEO. You have your “tech SEOs” and your “content marketers” and your “link builders”. You have your “News SEOs” and your “local SEOs”. So why are links the thing that are talked about so heavily? It’s easy to be in our myopic SEO bubble and think that something is talked about more than it actually is because it’s what our specific circles talk about. I decided to take a little bit different of a data visualization approach and so I downloaded the country interests for each and found the difference in interest by country. 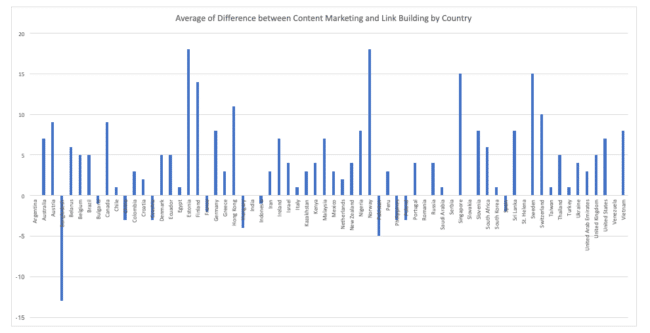 So, I think we can actually say that while link building seems like it receives too much attention in the SEO world, it is actually less popular than I thought in most countries and most are way more interested in content marketing than link building! Do links matter less now than before? My other hypothesis is that many SEOs still talk about links more than they should because for a long time links were the predominant ranking factor. They’re still a huge one to be sure, but are they the predominant one? I trust the Germans on this one, because they tend to take a very scientific and data-driven approach to ranking. Unfortunately a lot of the old studies (which were surveys, not driven off data necessarily) are now redirected elsewhere or are gone offline. 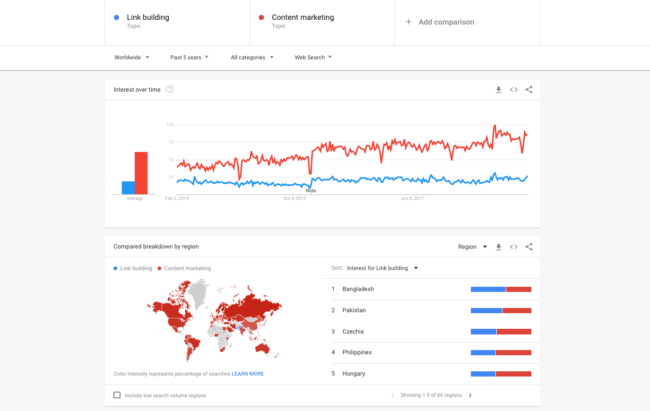 But we have seen, over the years, a general trend of links staying a strong factor but other factors growing as well such as structured data, on-page SEO, and technical SEO with a renaissance. Let’s also not forget personalization growing as a factor and that search engines now do a much better job of determining topic relevance and thus ranking content that better satisfies a user’s type of query or their query based on what they’ve visited before and found useful or not (likely based on usage patterns). Both images via Rand Fishkin’s post and Jumpshot. 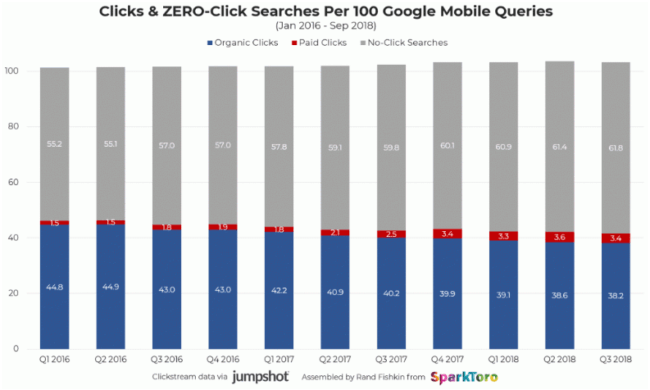 All this said (and maybe I am just stubborn) I do personally feel that SEOs concentrate too much on link building and other myopic topics, and that hurts our industry because it cheapens what we do. Instead, what we need to be doing is talking about SEO and how it impacts business. We need to be selling business results, not links and blog posts. It’s a small list, to be sure. There are many amazing SEOs out there who are very good at what they do and teaching their craft, but these are the ones I personally follow who consistently point us towards the business side. I don’t want to step on the wrong foot, but I would like to think links are still the most difficult aspect of SEO to acquire. On average a new small medium business can produce 50 pieces of great content, be at top of On Page and technical seo, but they won’t really rank unless they get decent quality contextually relevant backlinks. If there are two pieces of content, on two different domains with perfect On Page score, and one of them acquires a contextually relevant link from lets say Newyorktimes, which one of those two pages will rank? We have served nearly 200 clients in last two years and figured every single aspect of SEO is pivotal to growth of website, all major metrics such as Technical Seo, Site structure, Content completeness, Web hosting, Internal links, Social signals etc must be spot on, all of these aspects can be controlled with relatively less difficulty, but since the competition is extremely tight, none of this will matter as much if businesses don’t have a decent content marketing or link building strategy in place. And this is the most difficult aspect of SEO, as you cannot fully control the outcome, it is much harder to acquire a contextually relevant link from NT than it is to nail perfect on page seo. Hey Ahmad, we agree. As I said at the top, links are absolutely important to SEO but they are not all that SEO comprises. At the risk of putting words in his mouth, John Mueller would probably admit if pressed that links matter to ranking. He was simply saying that SEO’s focus *too much* on links, which doesn’t mean that SEOs shouldn’t care about them at all. I disagree with John. It’s hard to batch tens of thousands of marketers in a group and say they all focus on one thing too much. Especially, when that thing is agreed upon to probably be the most important factor. It’s the 80/20 rule, right? Focus on what will move the needle the most. 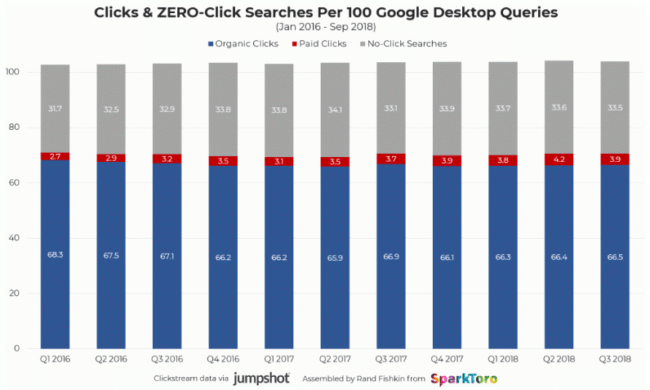 If John thinks people focus on it too much, so be it, but doesn’t it make sense that if links account for say 50% of rankings, that 50% of the questions and comments about SEO would be regarding links? Hi Tyson, so is your issue with John lumping SEOs into one or that you don’t think SEOs talk about links too much?